Low-value products such as putty and distemper are fast gaining traction. A recent survey of around 30 paint dealers across India conducted by IIFL Institutional Equities Ltd indicated sustained market share gains for these products in the March quarter. Since the market for these products is largely fragmented, getting a handle on their market size is difficult. However, dealers’ feedback is largely in line with management commentaries of key paint makers. Post the December quarter earnings, Asian Paints Ltd told analysts that sales of distemper remained buoyant. In the September quarter, it had pointed out that the share of distemper and wall putty has been on an uptrend. So, what is driving demand here? According to Asian Paints, this increase was led by channel stocking for the festive season and potential market share gains from the unorganized segment. Peer Berger Paints India Ltd told analysts that tailwinds from reduction in the goods and services tax (GST) rate would result in healthy growth in the distemper and putty segments. GST on paints, varnishes and putty was reduced from 28% to 18% in July 2018. And looks like the rate reduction measures are bearing some fruits. “Industry participants have witnessed increasing use of putty in rural areas. 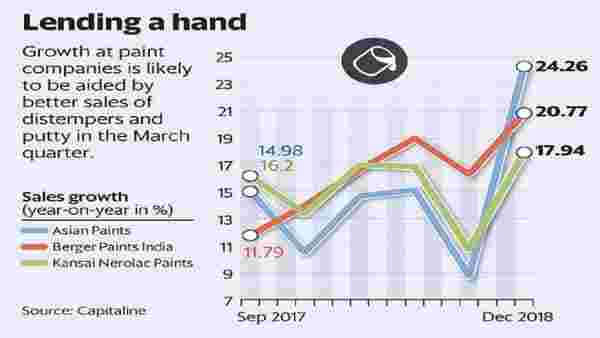 Direct application of paints on cemented or plastered walls is now reducing as rural consumers become aware of the benefits of applying putty over these walls before painting,” ICICI Securities Ltd said in a report on 1 April. Other factors such as increase in incentives to painters for putty purchases along with paints have helped. However, in the long term, this trend may not sustain. Berger Paints India believes that the changing mix of sales growth across the industry was fuelled by a pickup in sales growth of distemper and putty. And this would normalize going forward, as benefits from the GST rate reduction start to reflect in the base, the company told analysts. But for now, sector analysts expect high growth in low-value products to aid volume growth for paint companies in the March quarter of fiscal year 2019.